2nd Annual Rider's For Safety riding event. 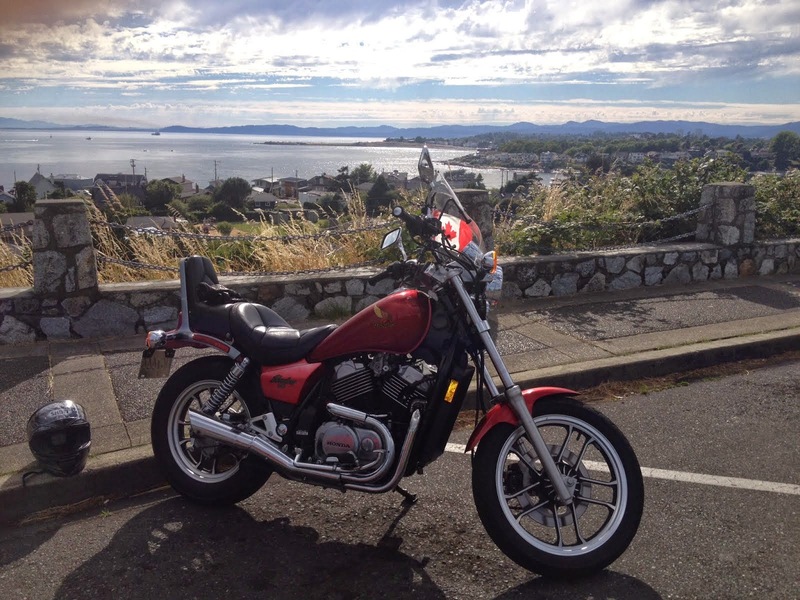 Route: The Malahat Highway to Mill Bay area and returning to Savage Cycles. We will be returning to Savage Cycles and there will be a moment of silence to remember those who have lost their lives on this road. Please show your support by attending. Riders For Safety 2011, Malahat Fire Chief Robert Patterson and Dave Rogers VISC instructor, this was taken during the moment of silence to remember all those who died on the Malahat. Rider's for Safety was formed in November 2011 to advocate for a safer and better Malahat Highway for all road users. We tragically lost several motorcyclists as the result of head on motor vehicle accidents when oncoming cars crossed the centre line. Approximately 300 Motorcyclists attended the ride to show respect and support our call to the Government for action. Riders For Safety and other Malahat stakeholders successfully lobbied the Provincial Government to make safety changes for the Trans Canada #1 Malahat highway. A traffic study was done and a number of safety recommendations have been made and many will be implemented in the coming months. This year Riders for Safety is focussing on SAFE riding practices and our group advocates for motorcycle safety, awareness and training. We are asking the public not to judge us all by the actions of one careless/reckless individual. As a community we do not condone the actions of those who drive recklessly and without care for others who share the roadway. Please wear appropriate riding gear. You are responsible for your own safety and liability. You must be able to maintain highway speed on your bike. Most Riders wore a caution sign with a picture of their loved ones, friends and families to show other road users who we have to come home safely to, this was mine. Victoria, British Columbia, 2012 INTERNATIONAL FEMALE RIDE DAY event. All are welcome! *Bikes must be able to maintain highway speed. 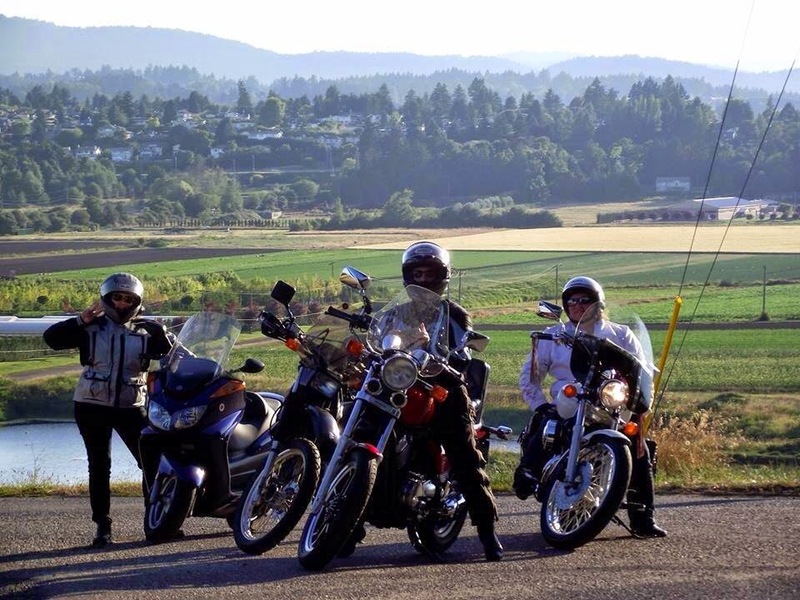 Date: Friday, May 4, 2012, Gorgeous West Coast Scenery and lots of lovely twisties to ride! This is a breathtaking ride which showcases how truly beautiful our Island is. We will be doing a modified ride for new riders and more experienced riders will continue onto a more technical ride. Don't forget your camera! We even have swag which has been donated by generous businesses across the island ~ Thank you! We will be stopping in Sooke for Lunch. We will meet back at Savage Cycle between 4:00 to 5:00pm for Swag Draws. 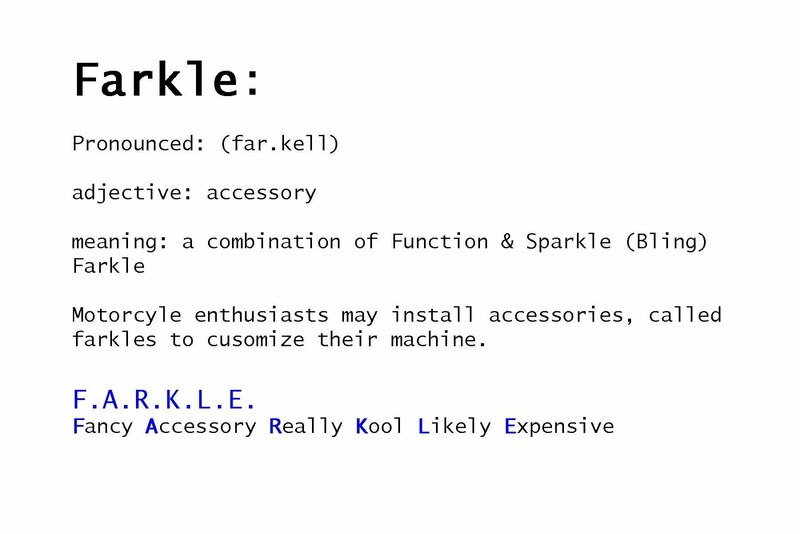 Our SWAG is fabulous! Examples of some of the swag: 1 Advance Rider's Course, Custom Ear Plugs, restaurant gift certificates, spa gift certificate, Motorcycle boots (1 pr), Motorcycle gloves, Deluxe detailing kit and many more fabulous goodies! **All riders need to wear proper riding gear and ride within their abilities. *There will be a group for NEW riders which will be making more stops as necessary. Everyone will be involved and no one left behind! Remember SAFETY FIRST! This ride is not about speed and we will be riding within the set speed limits, all traffic laws and regulations will apply. Participants in this ride are responsible for their own safety and liability. HAPPY 1ST BLOGGOVERSARY TO ME!!! It's official I have been blogging for one year! What a year it has been. I have had so much fun and met so many great people in blog land. Stay tuned for more adventures! Saturday was a day of adventure! I got up early, had breaky and got all of my riding gear together. I was meeting my friend Kiwi Deb and our friend Kristen for a ride to Port Renfew to ride the loop. Deb also invited her experienced rider friends Brian and Stephen. They were awesome and patient with us newbs! The Loop is an amazing scenic ride twisting up Vancouver Island's West Coast. It is very rural and in places desolate. After Sooke there is very little cellular connection and its spotty at best. I would highly recommend that you let folks know where you are going because it is pretty isolated. It was hard trying to decide what to do about what type of gear to wear. I opted to leave the quilted liner in my jacket (very glad I did that) I only went with the single liner in my pants. I had a vest and my wind/water proof gloves with liner. It started out to be warm, but then quickly cooled off. Brian was our lead rider and he was excellent! He was very thoughtful of all of us in the group and pulled over to keep us together and to let the antsy sports car drivers past and other motorcyclists who decided they need to drive fast. This road is NOT about fast. It is very twisty has lots of sharp turns. LOVED IT. Our sweep rider Stephen was very experienced and it was great know he was back there watching out for us. We wound our way up the coast, stopped at French Beach and then had lunch in Port Renfrew and made our way back the loop through Lake Cowichan, Duncan and finally home. It was a great day. Only thing that would have made it perfect would have been if Motorcycle Man could have come, unfortunately he was under the weather. 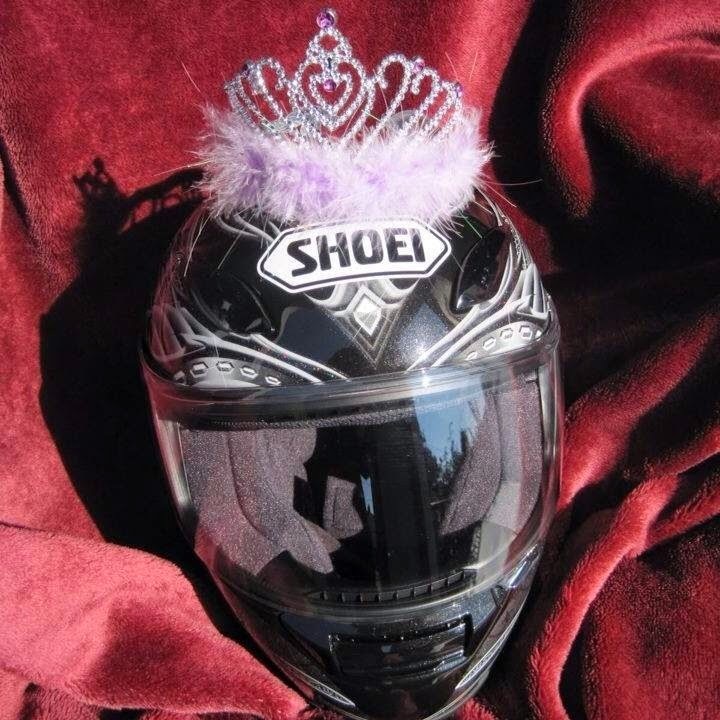 Fellow Moto blogger Helmet or Heels sent out a call to female riders. She is profiling female riders to let the world know about us and why we ride. She sent us a list of questions and asked for pictures. This is awesome! She profiled ME yesterday, *blushing*. 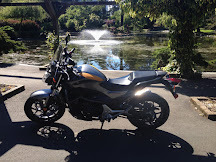 It is wonderful to read about my two wheeled sisters and see why they are interested in riding and how they got started and what they ride. It is such a diverse group, with women who have been riding since they were teens or younger to oldsters like me who started lated in life. One common thread that seems to run through us all is our sense of adventure and that we love riding passionately. I invite you to check in and read her lovely blog. Pam you are doing a wonderful job and the collages are beautiful! Thank you for sharing our stories!! You also need to do one on yourself too! Every few months I like to post the searches that people have used to find Scooterpie. Deb and I went for a Monday afternoon tootle. It was gorgeous out and not cold at all. We found ourselves at Esquimalt Lagoon. It was lovely and several bikes went by, so it is indeed moto season. This is my buddy Moosey - not very original, but my hub gave him to me when we were dating. We tootled up the Malahat & stopped at 'The Hat' to turn around and go back down. I have been away from the blog for the last 2 weeks. I was feeling a little out of sorts and combined that with a very busy schedule it sometimes makes things wait. In this case it was the blogs turn to chill on the back burner a bit. Spring has finally decided to come to the Island. Oh! Miss Spring you are gladly and heartily welcome here by this winter worn Princess Scooterpie/Moto_Diva. I have officially commuted all four seasons and think of myself as a rider now (I felt like I was a pretender there for a bit or poser if you will) I am an All Season Road Warrior Princess! This weekend had a little bit of riding in it, a little bit of family stuff, and a little bit more riding! Motorcycle Man, Scooterpie Jr and I took to the road on Friday as a family unit. We road some twisties and then out for a bite of lunch in the GORGEOUS sunshine!!!!! After Scooterpie Jr nestled in for the afternoon, Motorcycle Man and I went for a ride up the Malahat and I GOT TO RIDE HIS 750 MONSTER!!! YEAH BABY!! 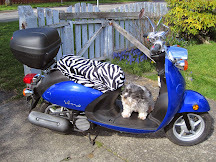 I am certainly glad she isn't my bike, because I could see my self getting into issues with speeding. Motorcycle Man and Scooterpie Jr. Notice her new bike jacket - Happy Easter! Fully armored & cute. Easter Sunday dawned and was spectacularly sunny and warmer than it has been for the last few days. After church we were going up Island to have a family supper with my folks, my sister and her beau. When I pulled up in front of the house after church Motorcycle Man had Scarlet out on the street, he was checking her oil, adjusting her tire pressure and making sure she was road ready. I had only given riding to Nanaimo a passing thought because the weather was supposed to change to rain, but all it took was an encouraging nod and smile from him and I was off! He followed behind with Scooterpie Jr in the car and she was shooting video and pictures of me riding over the Malahat and up the Island Highway. I was happily cruising at the speed limit and it felt really comfortable riding Scarlet, I could have ridden for 1,000 miles. I saw a few other folks on bikes, got the wave and it still makes me break out in a goofy grin. There was one doofus on a sport bike who snuggled up close behind Scarlet in our lane and then decided to pass on the right - it is jerks like that who give the rest of us a bad reputation and he decided speeding was a good thing too. Whateva! just stay away from me and we are all good. All I have to say to him is -"GRASS HOPPER, you will learn that speed does not always get you to your destination and sometimes it takes you to places you do not really want to go." Scooterpie Jr, had the camera hanging out the window on telephoto, so its a little blurry. BTW I was well back from their car, I was using all my road tools and making sure I had good space margins around my bike and using the 2-3 second rule. Thank goodness for great gear! It still is a little nippy this time of the year and I was toasty as a bug in a rug on a winter night. Speaking of bugs, I am glad I had my visor down, I got smacked with something ginormous that splatted - ICK! Motorcycle Man is really thrilled with my bike, he is very happy with its performance and that it fits me like a glove. I love Scarlet she rocks! I kicked her into overdrive and just cruised, I am quite content doing the posted speed and it is definitely not about speed for me. The best part was when people went by and saw me riding a couple of them smiled, a few little kids in back seats waved and pointed. So I guess an old lady on a bike is a cool thing.